A patient lies unconscious on the operating table. Fluid in her brain cavities has built up to dangerous levels. For the patient to survive, a neurosurgeon must drill a hole in her skull to insert a drainage tube. And fast. But a slight slip of the surgeon’s hand could result in hemorrhaging, memory loss, partial paralysis or even death. This kind of high-pressure situation demands perfection, but that perfection takes practice. “Imagine trying to learn in an environment where you are not allowed to make a mistake,” says Frank Bova, professor of neurosurgery at the University of Florida medical school. Bova has come up with a novel application of 3-D printing that lets neurosurgery residents slice into realistic skulls and brain tissue with zero risk. He feeds a patient’s X-rays, MRIs and CT scans into a 3-D printer, and out comes an exact replica of that person’s head or spine, from bone to brain matter. 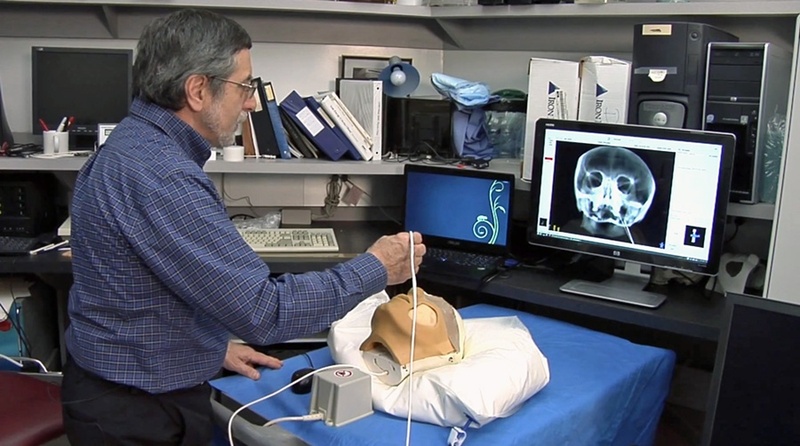 A monitor attached to the model shows the resident simulated X-ray images of the mock patient’s head in real time, as is the case in actual surgery. Computerized instruments also track and record the neurosurgeon-in-training’s every move so faculty can pinpoint exactly when and where something goes wrong. Practicing neurosurgery with realistic physical models is a recent improvement over cadavers or virtual reality programs, which don’t offer the range of clinical conditions a surgeon must know how to handle. Bova’s 3-D-printed simulator offers the best of both and then some: exact (and individualized) anatomical detail, realistic feel and interactivity. Plus, it’s relatively cheap and customizable. These kinds of sophisticated simulators let educators evaluate residents’ individual skills as well as the effectiveness of training methods. “It’s a whole paradigm shift in education,” says James Harrop, a professor of neurological surgery who co-directs the Congress of Neurological Surgeons’ simulation program. Bova hopes his 3-D-printed models will guide the next generation of brain surgeons, helping them to practice and perfect the complex cognitive and manual skills necessary for brain surgery — without the life-and-death pressure of the operating table.